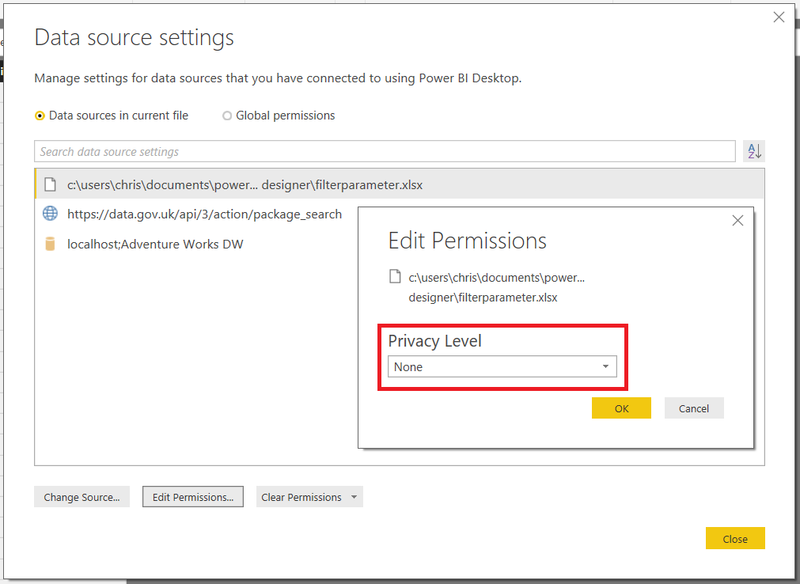 In part 1 of this series I showed how the data privacy settings in Excel Power Query/Get & Transform and Power BI could impact the performance of your queries. In this post I’m going to show you how they can stop a query from running at all. In fact it doesn’t really matter what it does, just know that it is a web service that I can pass a text parameter to and get a result from. Formula.Firewall: Query ‘WebFunctionSucceeds’ (step ‘ImportedJSON’) is accessing data sources that have privacy levels which cannot be used together. Please rebuild this data combination. While it’s ok to send data from one Public data source to another Public data source, or from one Organizational data source to another Organizational data source, you cannot send data from one Private data source to any other data source, or even send data from a Public data source to a Private data source. In the example in my previous post when the engine found it wasn’t allowed to send data from one source to another because of the data privacy rules used it was still able to run the query, but had to do so in a less efficient way. In this example there is no way to run this query without sending data from the Excel workbook to the web service – you can’t call this web service without sending a search term to it. As a result, if incompatible data privacy levels are set then the query returns the error shown. Notice that in the query above I’m reading data from Excel and sending it to the web service in a single M query. This is deliberate! In the next post in this series I’ll be looking at examples where the engine can’t work out what it’s supposed to do and errors, even if the privacy levels used suggest the query should run. 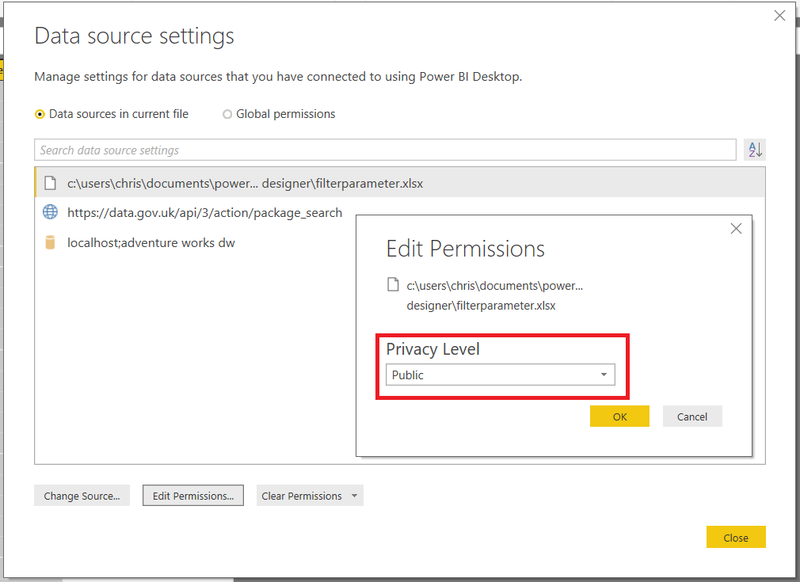 One of the most confusing, under-documented and widely-misunderstood features of Power BI and Power Query (or Excel “Get & Transform” or whatever you want to call it) are the data privacy settings. I get caught out by them all the time, so I thought it would be a good idea to write a series of blog posts demonstrating how they work and what effect they have in different scenarios using example M queries. 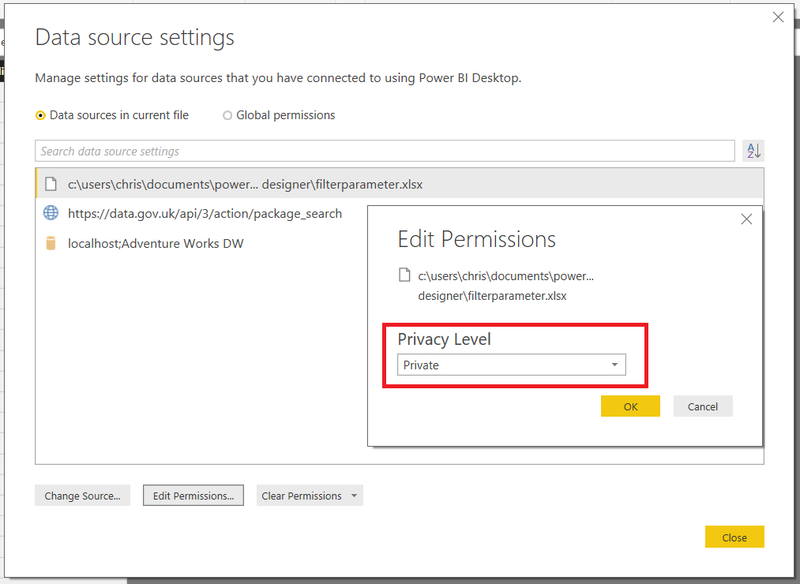 It gives you a good grounding in what the different data privacy levels are and where you can set them in the Power BI UI. The same options are available in Excel with Power Query/Get & Transform. 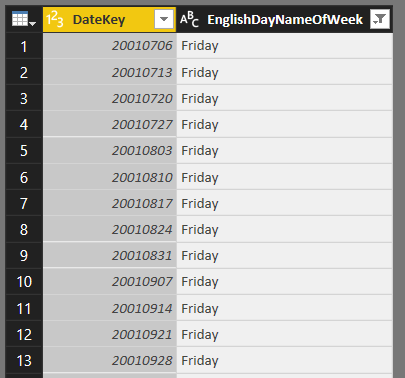 Here’s an M query called DimDate that filters data from the DimDate table in the Adventure Works DW database, returning only the rows where the EnglishDayNameOfWeek column matches the value returned by the FilterDay query above. The dropdown boxes in the left-hand column allow you to be more specific in what you set privacy levels on; in the case of the Excel file you can choose to set permissions at all folders in the path down to the workbook and the workbook itself; in the case of SQL Server there is the option of setting privacy levels on the database rather than the server. However, this “None” setting means it inherits its data privacy settings from the level set for the c:\ drive set earlier, even though this setting isn’t displayed on the “Data sources in current file” tab. Hopefully the fact this is happening will be addressed in a future release: I think the current UI is misleading. Query folding is almost always a good thing for the performance of a query. For more details on what query folding is, see here. 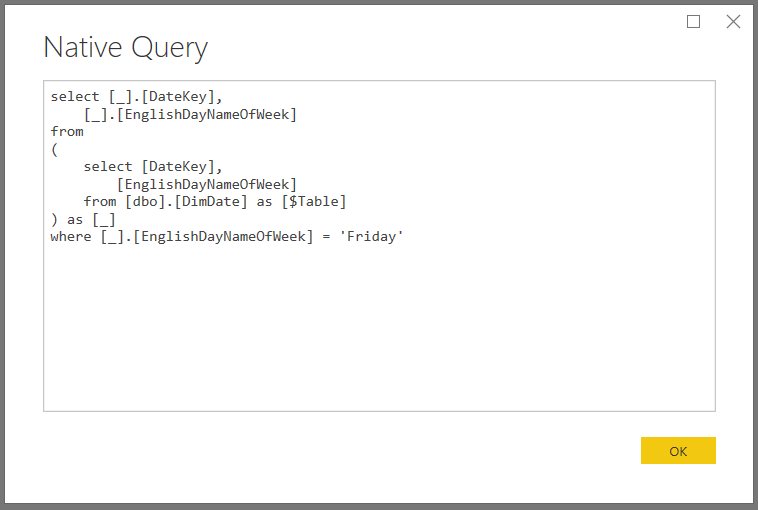 Note that there is no WHERE clause in this query and that the whole of the DimDate table is returned from SQL Server. Data from a data source that has a privacy level of Private can never be sent to another data source. That is exactly what needs to happen for query folding to take place though: a value from the Excel workbook – the text “Friday” – needs to be embedded in the WHERE clause of the SQL query sent to SQL Server in order for filtering to happen inside the database. The risk with query folding is that a DBA could monitor the queries that are being run on SQL Server, look at the WHERE clauses, and see data from your Excel workbook. That’s maybe not a problem with day names, but potentially an issue if you were working with more sensitive data like customer names or addresses. Therefore, with the Excel workbook’s privacy level set to Private, the whole of the DimDate table is downloaded into the M engine and the filtering has to take place there to maintain the privacy of the data in Excel. The query still runs but it will probably be a lot slower than it would have been had query folding taken place. With the privacy level of the Excel workbook set to Public, on the other hand, it is ok to send data from Excel to SQL Server so query folding does take place. To sum up, in this post I have shown how different data privacy settings can affect the performance of a query by determining whether query folding takes place or not. In part 2 of this series I will show how different data privacy settings can determine whether a query executes at all. Click here for part 2 of this series. SSAS Multidimensional: Are Your Indexes Processed? If you are using SSAS Multidimensional and you use Process Update to process your dimensions, here’s something for you to try: run a Process Default on your cube. Does it finish in a few seconds? Then you’re ok. If it doesn’t, and it takes minutes or even longer then read on – you might have a problem that’s causing slow query performance. Now you can see the ATTRIBUTE_INDEXED property is set to true for most attributes. Note that there is an (All) attribute that is never indexed, and if you have set the AttributeHierarchyEnabled property to false or the AttributeHierarchyOptimizedState property to NotOptimized on an attribute, it will not have indexes built for it either (this is typically done to improve processing performance – see here for a few more details). In a real-world cube it is likely that only a few indexes will be dropped on partitions as a result of a Process Update on a dimension, and even then this will depend on whether any changes take place in the dimension’s data, so you will have to look down the list of attributes returned by this DMV very carefully to see if ATTRIBUTE_INDEXED returns false when it should be returning true. The solution to this problem, as several of the posts I’ve linked to above suggest, is to always run a Process Default on your cube as the last step in your processing schedule. A Process Default will process any object that is in an unprocessed state, so it will automatically rebuild any aggregations or indexes that are dropped as a result of Process Updates on dimensions. Although it might not sound that exciting, I think this is one of the biggest things that’s happened to Power BI in a long time. Microsoft’s most successful products are always the ones that are platforms for its partners to build their own solutions on top of, and Power BI is no exception. Custom visuals have made an important contribution to the success of Power BI as a whole, allowing third parties to build visuals that Microsoft either didn’t have the resources to build itself or didn’t realise people wanted. Similarly, custom data connectors will only increase the already impressive number of data sources that Power BI can connect to. My guess is that a lot of SaaS and data providers will want to build their own custom data connectors, and that the number of custom data connectors available is going to explode. Why go to all the trouble of trying to build BI and reporting features into your product when it’s quicker and easier to send the data to Power BI and your users get a much better experience as a result? This doesn’t just affect Power BI though. Since the new Get & Transform functionality for loading data into Excel (see here) is based on the same Power Query technology that is used by Power BI, these custom data connectors will at some point work with Excel too. Although it will be a while before most Excel users upgrade to a version that supports custom data connectors, when that happens the sheer size of the Excel market means that there will be even more demand for custom connectors and this will in turn strengthen the Power BI ecosystem. Don’t forget that Analysis Services Tabular 2017 also now uses Power Query for loading data, so this will benefit corporate BI users too. From a purely technical point of view today’s announcement included some welcome new capabilities for M coders like me. These include Visual Studio integration (intellisense for M!) and the ability to connect to web services and use OAuth for authentication, something that wasn’t really possible before. It’s also interesting that you can create custom data connectors that enable DirectQuery connections from Power BI, and that you aren’t limited to importing data. Whenever you get an error message like “Function ‘RANKX’ is not supported in DirectQuery mode” you know you’re trying to use a DAX function that isn’t allowed by default in DirectQuery mode. …this is done for performance reasons. In Power BI, every time you interact with a report (by opening it, clicking on a slicer etc) a series of DAX queries is sent back to the Data Model to get the data needed by the report. In DirectQuery mode, all of these DAX queries – including any calculations – are translated into queries that are sent back to the data source. If that data source is SQL Server, then Power BI generates SQL queries. Not everything that you can do in a DAX calculation can be translated back into efficient SQL, so to prevent you from accidentally building calculations that will perform badly in DirectQuery mode Power BI tries to prevent you from using any DAX functions that it thinks it can’t generate efficient SQL for. For the DAX functions in the list, if DIRECTQUERY_PUSHABLE is 0 then it is not available in DirectQuery mode by default. If it returns 1 then it is available in measures but not calculated columns; if it returns 3 it is available in both measures and calculated columns (I guess 2 means that it is only available in calculated columns, but there are no functions with this property value right now). However this is not a definitive guide to whether a function is actually ‘pushable’ or not: some functions could be pushable in some scenarios, or with certain combinations of parameters, and not others and the UI may perform additional checks to decide whether a function can be used. Thanks to Jeffrey Wang and Marius Dumitru for answering my questions about this. My good friends Marco Russo and Alberto Ferrari have published a second edition of the SSAS Tabular book that we wrote together a few years ago. It’s called “Tabular Modelling In SQL Server Analysis Services” and it covers pretty much everything you need to know about building models in SSAS 2016 Tabular. Although I didn’t have anything to do with preparing the second edition, it does include a few things I wrote for the first edition so I can’t pretend that this is an unbiased review – that said, I think it’s fair to say that everyone working with SSAS Tabular 2016 should have a copy of this book on their shelf. No-one knows SSAS Tabular better than Marco and Alberto and the chapters on engine internals and performance tuning are worth the price of the book alone. The only topic it doesn’t cover in detail is DAX, and of course if you want to learn DAX you should get a copy of Marco and Alberto’s equally brilliant book “The Definitive Guide To DAX”. More details on the new book can be found in Marco’s blog post here and you can buy the book from Amazon UK here.